Testing and analysing the audio performance of speakers, amplifiers and other equipment requires different pieces of hardware and software. My main system is centered around a computer equipped a high-quality audio interface and a dedicated audio analysis software, and a measurement microphone for acoustic tests. Of course, I also use an oscilloscope and a multimeter. Schematic of a typical testing setup (from the MATAA manual). In this example, the device under test (DUT) is a loudspeaker, which is fed with a test signal from a computer equipped with a sound card or external audio interface via a power amplifier (A). The test signal reproduced by the loudspeaker is recorded with a microphone (B) via a suitable suitable pre-amplifier (C) and an anti-aliasing filter (D). The signal is then digitized using the computer hardware, and is then analyzed using the different computer algorithms. Acoustic analysis of a loudspeaker using a microphone. 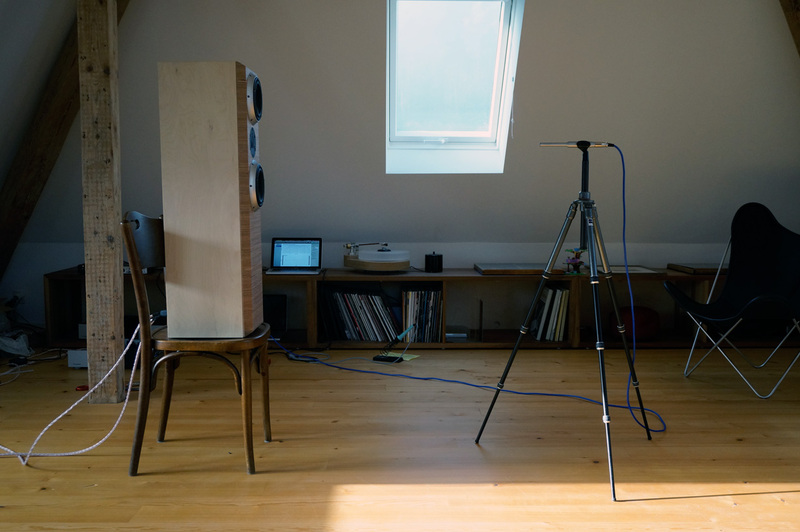 The loudspeaker is placed on a chair to increase the distance to the floor, which results in a better separation of the signal reproduced by the speaker and its echo from the floor. Signal input is either microphone at front panel or line level at rear of the FW-410 (there is no line-level input at the front). Choose input using the “Mic/Line” switch on the front panel. Headphone output on the front panel is for monitoring during sound recording. Don’t use this as signal output for audio measurements. Use the line level ports at the rear of the FW-410 instead. Sample rates higher than 96 kHz may not work well with asynchronous sound I/O. Just use 96 kHz or less if possible. The driver software comes with an elaborate software mixer program. As far as I can tell, this is used to route the different audio ports to the headphones / monitoring port on the front panel of the FW-410. For audio measurements, just use the default settings of the software (click «reset» if you screwed up the settings). The software also displays the signal levels at the different sound I/O ports, which is useful with audio measurements. M-Audio tends to be slow with maintaining the driver software. Let’s hope the driver still works with future releases of Mac OS X. Linux support for the FW-410 may be better (I have not tested this yet). I mostly use MATAA, which I prefer over ARTA, FuzzMeasure Pro, HBX, etc, due to its versatility and functionality. I use a Behringer ECM-8000 measurement microphone. This microphone does not cost an arm and a leg, but it still provides decent measurement performance. Like many other measurement microphones, the ECM-8000 requires a phantom voltage and a microphone pre-amplifier. I use the Stage Line MPA-102 microphone amplifier, or the built-in microphone amplifier of the audio interface.